The Lake Partner Program is a province-wide, volunteer-based, water-quality monitoring program. Volunteers collect water samples and make monthly water clarity observations on their lakes. This information allows for the early detection of changes in the nutrient status and/or the water clarity of the lake due to the impacts of shoreline development, climate change and other stresses. Volunteer involvement requires the collection of one sample each month (May-Oct). These samples are then sent to the Dorset Environmental Science Centre for analysis. In addition, volunteers also make water clarity observations using a Secchi disk. Total phosphorus concentration measurements are used to interpret nutrient status in Ontario lakes, since phosphorus is the element that controls the growth of algae in most Ontario lakes. Increases in phosphorus will decrease water clarity by stimulating algal growth. In extreme cases, algal blooms will affect the aesthetics of the lake and/or cause taste and odour problems in the water. Lakes are generally divided into 3 categories based on their phosphorus content. Oligotrophic (less that 10 µg/L total phosphorus): These are dilute, unproductive lakes that rarely experience nuisance algal blooms. Mesotrophic (between 10 and 20 µg/L total phosphorus): These lakes show a broad range of characteristics and can be clear and unproductive at the bottom end of the scale or susceptible to moderate algal blooms at concentration near 20 µg/L. Eutrophic (over 20 µg/L total phosphorus): These lakes exhibit persistent, nuisance algal blooms. The following chart shows the total phosphorus in Buck Lake at the three sample points on the South Branch. The black line on each chart at 10 µg/L highlights the limit at which our lake water quality is considered good. 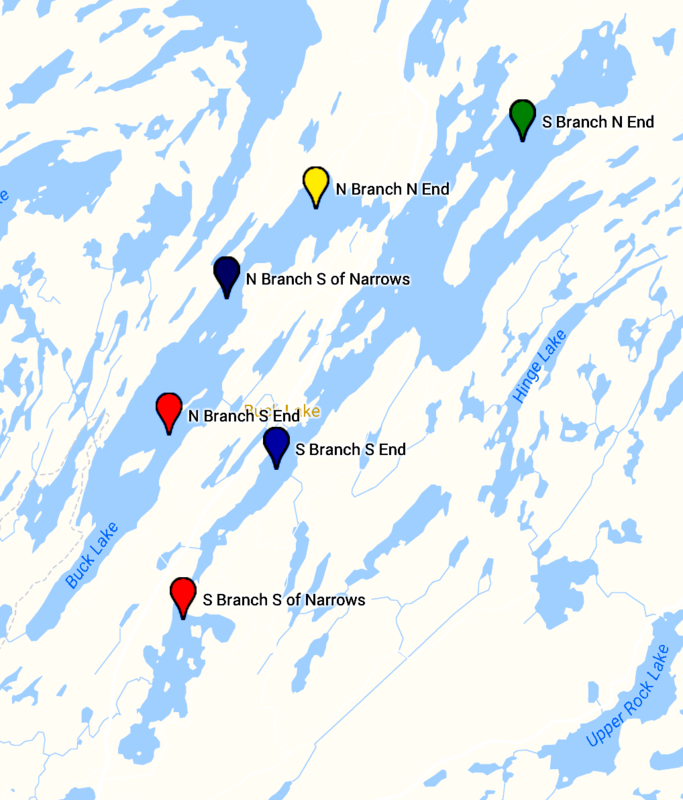 While the results are generally good, it should be noted that they are higher south of the Narrows than in the other areas of the South Branch. This is likely the most highly populated area of the South Branch, indicating that human development around the lake is having a real and measureable impact on the phosphorus levels in the lake. 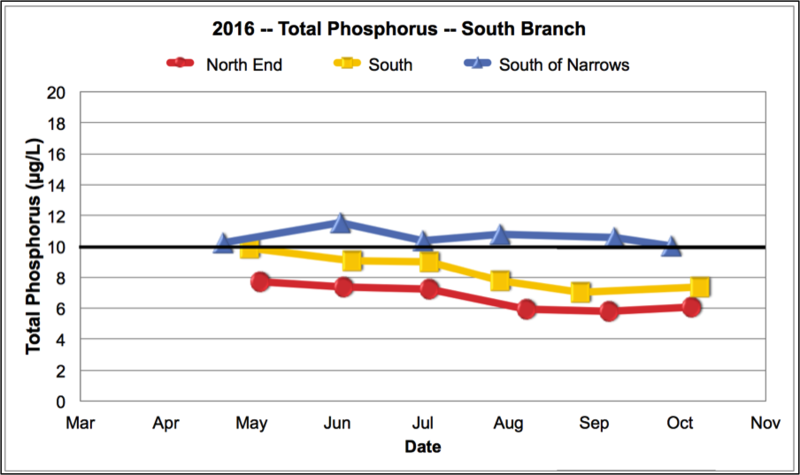 The 2016 North Branch phosphorus levels were also generally very good, with the results from the north end of the North Branch returning to pre-2014 levels. This supports the hypothesis that the high phosphorus measurements from 2015 were due to a beaver dam breaking and dumping in water from Labelle Lake. However, similar to the sample from south of the Narrows on the South Branch, the sample at the north end of the North Branch is quite a bit higher in phosphorus than the other two North Branch samples. Again, this is the area on the North Branch with the highest population density again indicating that we are having an impact on our lake water quality and need to be careful about how our activities affect Buck Lake. While total phosphorus concentrations are the best way to describe the nutrient status of the lake, regular Secchi depths can help to identify changes in water clarity that are not linked to nutrient status (zebra mussels, climate change, etc.). 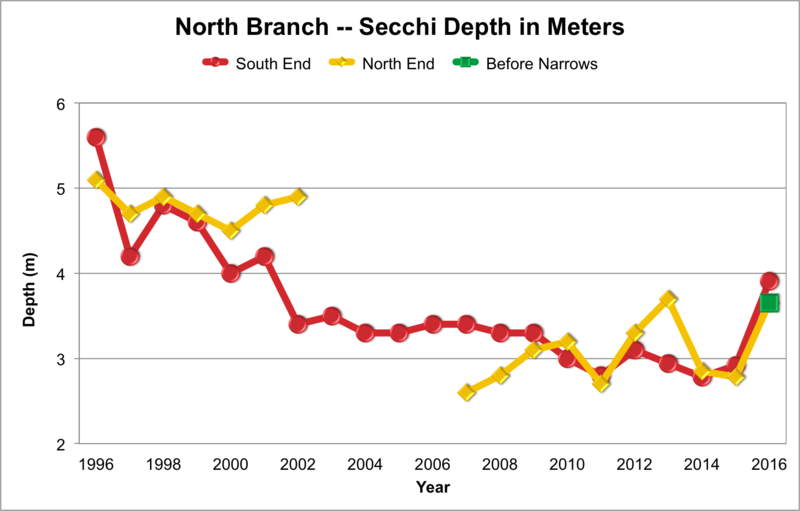 Secchi measurements are preformed by lowing a Secchi disk into the water until it is no longer visible, and then recording the depth of the disk. 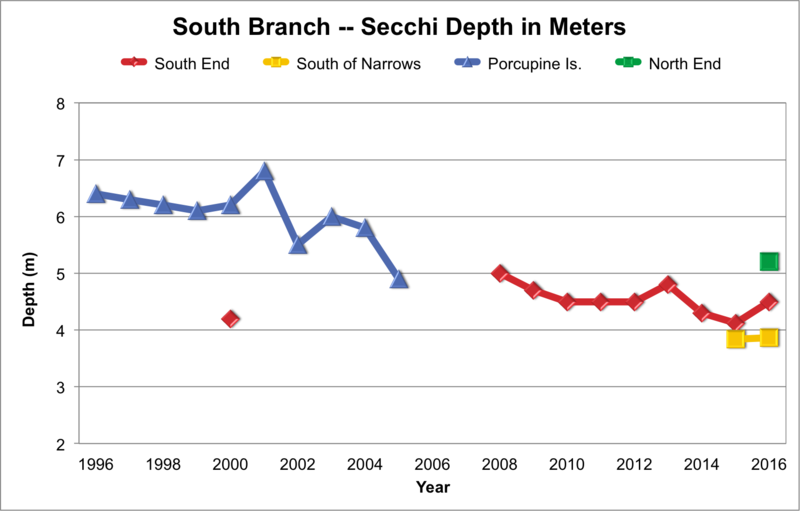 As shown in the graphs below, the Secchi disk measurements have been gradually decreasing since 1996. This means that the water in the lake was becoming less clear. However in 2016, there was an increase in the clarity, particularly on the North Branch. The reasons for the improved clarity, however, are not clear. 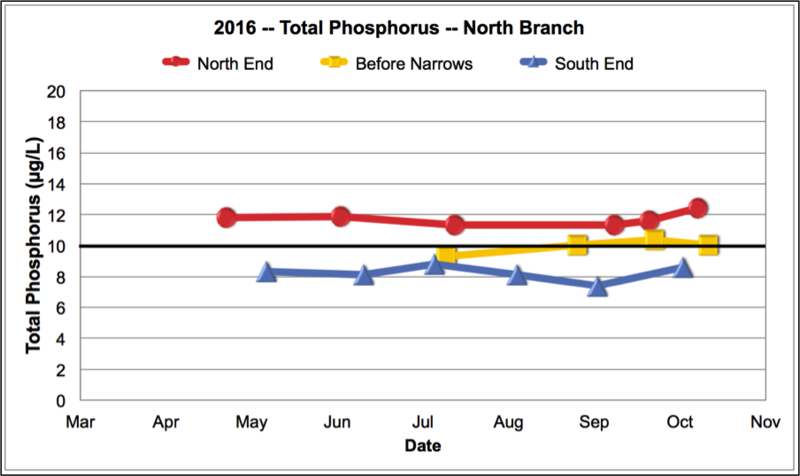 The improved clarity may be related to the lower phosphorus levels in 2016, particularly on the North Branch. The presence of zebra mussels can also result in increased clarity. As zebra mussels feed, they filter plant plankton from the water, making the water clearer, but not cleaner. As the sun is able to penetrate deeper into the lake, aquatic plants can take root in more extensive areas than they did before zebra mussels appeared. This is unlikely an issue on the North Branch where the calcium levels in the lake are too low to sustain zebra mussels. However, zebra mussels have been found throughout the southern end of the South Branch and may be having some impact on the water clarity.